TRAILBLAZER™ UTV Plows for Sale in Brookfield, MA | BRIAN'S TRUCK EQUIPMENT INC.
Get the most out of your utility vehicle this winter with the FISHER® TRAILBLAZER™ line of UTV plows. Available in a v-plow or straight blade, these plows are engineered to withstand the toughest commercial plowing applications. Designed to fit a variety of UTVs, TRAILBLAZER™ plows are perfect for home use, residential properties, colleges and municipalities in Brookfield. Hooking up the TRAILBLAZER™ v-plow or straight blade is simple. With the receiver brackets installed on your utility vehicle, either drive in or manually push the plow into the receivers. Push up on the headgear to engage the hitch pins in the receiver holes, then slide the handle to lock the hitch pins in place. Finally, connect the electrical plug. Detaching the plow is just as easy. The receivers are removable, to maintain ground clearance. Receiver brackets can be easily removed, restoring your vehicle back to its original ground clearance when the plow is not in use. We build our own hydraulics for unmatched speed and durability. Fast hydraulics allow you to change the blade position quickly and easily for efficient plowing. All critical hydraulic components are fully enclosed for protection from the elements. The 6' wide, 14-gauge powder coated steel moldboard and standard 5" high-carbon steel cutting edge make the TRAILBLAZER™ straight blade a strong choice that is the right size for your UTV. With four vertical ribs and high-strength, low-weight, alloy steel construction, the TRAILBLAZER™ UTV straight blade is strong enough for commercial operation and light enough to fit most UTVs. Featuring a 6' wide powder coated steel flared moldboard, the TRAILBLAZER™ UTV v-plow blades go from a 25¾"" center height to a full 29¼"" at the outer edge. A high-carbon steel cutting edge also comes standard, increasing wear resistance. The high-strength, low-weight alloy steel components are both stronger and lighter than traditional steel, so your utility vehicle can work hard without having to carry the extra weight on your UTV frame like with heavier plows. The TRAILBLAZER™ v-plow blade is reinforced with six vertical ribs, and features the strength of our proven T-frame design. Each v-plow blade features independent trip-edge protection to get over bumps and hidden obstacles, whether in V, scoop or straight blade configuration, helping to protect the plow, the UTV and the operator. Since only the bottom edge trips, snow stays in front of the blade, so you can keep on going without dumping the entire load of snow. The FISHER® trip edge uses compression-type springs that never require adjustment and will not wear out like extension springs. Double-acting cylinders allow the operator to lock the wings together to use the v-plow in straight blade mode with single button control. Double-acting cylinders also hold the wings firmly in place for clean, efficient back dragging. 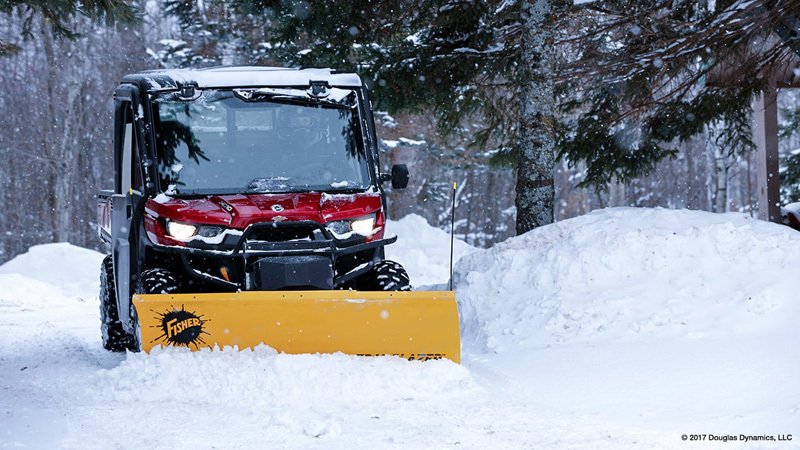 For exceptional snow containment in all positions, the TRAILBLAZER™ UTV v-plow has a center deflector designed to prevent snow from going over the top of the blade and the formed cutting edges reduce trailing snow. When fully angled or in V mode, the TRAILBLAZER™ UTV v-plow plowing path is 5' wide, and 4' 7" in scoop. For UTVs with a wider wheel base, a width-adjustment setting is available to make your plowing path wider in these positions. Using the alternate setting, the plowing width is 5' 6" when fully angled or in V, and 5' 1" in scoop. Choose between the ergonomic Fish-Stik® hand-held control or the dash-mounted joystick control (not shown) based on your preference. Both feature automatic shutoff, backlit buttons for night operation, and LED lights which indicate "power" and "float" mode. Both controls have a plug-in connector for easy removal. Cutting Edge 1/4" x 5" ¼" x 5"